Check out the video at the end of this review and toss your name into our free giveaway – of THIS KNIFE! Do you ever notice that sometimes the value you place on an item has something to do with how much (or how little) you pay? For example, if you bought a $300,000 Lamborghini, then you’d probably put a lot of value on it, and you’d probably spend some mental energy thinking about it, etc. On the other hand, the opposite situation sometimes has the same effect. Here’s what I mean; A few years back I bought 2 bikes for my kids at around $100 each. They were decent bikes and the value was about $100, so I was generally satisfied. Then, a year later, I stumbled across a bike that I knew had a value of at least $300 (I checked the local bike shop) but someone on Craigslist just wanted to dump it. I paid $60 for it!!! Because the value of the bike was higher than my other bikes AND I paid less, valued and cherished that bike more than if I had just paid the market value of around $300. Does that make sense? If not, too bad, I’m done! What does this have to do with anything? Well, when I opened the package of the Cold Steel Pro Lite Clip, I had a similar feeling to what I experienced when I bought the $300 bike at a steal! Because I knew the quality of Cold Steel, I was thrilled to find any Cold Steel knife at such a bargain price (well under $50). However, I made the incorrect assumption that because this was an entry-level offering from CS, it would necessarily cut too many corners and therefore be a piece of junk. I was pleasantly surprised at being so “incorrect”! It’s saying something when Cold Steel itself rates this knife as a “heavy duty folding knife”. That may explain lots of other things about this knife too. The second I picked it up, I had no problem deciding in about 3 seconds that this was not a flimsy, fragile knife. Its tough locking mechanism and overall sturdy feel speaks volumes of its likely lifespan. For that, we think this Andrew Demko design is something that a good many folks will appreciate! We’re also thrilled that Cold Steel understands the idea of weight. While lots of people love the idea of a heavy, solid piece of hardware that “feels” like it’s high quality, the statistical reality is that most people will NOT carry an EDC knife that is so heavy that you’re constantly reminded that it’s strapped to your body or sagging in your pants! The light weight of the Pro Lite is a strategic decision we cannot applaud loudly enough! Out of the box, it’s very sharp, but that seems to be the case with many of my other recently purchased EDCs from Benchmade, Spyderco, Ontario Knife, Kershaw and Buck. So, that’s no surprise. The German 4116 Stainless steel is neither exceptional nor unexpected in a budget offering like the Pro Lite Clip. For the sake of giving you a quick, actionable (not long and tedious) review, we can say that the qualities of the 4116 steel are similar to AUS-8 or 420HC. It’s basically a fairly soft, entry level knife steel that resists corrosion pretty well, but because of the lack of carbon, it’s not that tough and won’t hold an edge like the higher carbon steels (ie. D2). The blade is high satin polished and cryo-quenched. Cryo-quenching just means that during the manufacturing process, the steel is cooled very quickly with liquid Nitrogen to -301˚F which increases hardness and strength. 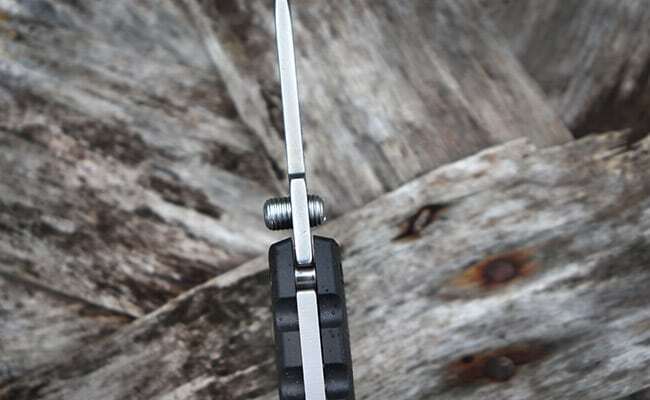 We reviewed the clip point model but there is a drop point and tanto version too. There is no significant swedging on the top of the blade though there is the tiniest trace of it. This is also one of the few blades I’ve seen recently that does not have any gimping at all. I think that’s just fine since I think that gimping is often more of an aesthetic addition meant to attract buyers to the knife rather than being a significantly functional feature. There is, by the way, some gimping but it’s on the knife handle near the blade in the “thumb-rise” area – though there is absolutely ZERO thumb rise in this knife. The construction of the handle is glass-filled nylon (GFN) and it comes in both black and blue options. The design on the handle is exactly NONE! We would have preferred some scaled design to add character and soul to the knife, but Cold Steel felt differently, so they kept the texture on the handle VERY minimal, though there is some texture that keeps it from being perfectly smooth. The Tri-ad lockback is VERY tough, but that’s just the nature of the beast. The lock exerts so much friction on the blade during the opening and closing range of motion that it’s relatively difficult to open or close. This is not a “flick-open” type of knife (at least not out of the box!). We found the studs to be a bit unusual. The studs are actually “the stud”. It’s a one-piece threaded stud that actually looks like a short chunk of a metal screw. The idea here is that with a very strong wrist and a good straight slot screwdriver, you can adjust the stud to fit your preferred hand. The default setting is set to favor right-handed user. I had no luck in adjusting the screw though with some WD-40 and wrench with a driver head, I may have made some progress, but since it was set to fit me perfectly, I didn’t bother. Not much to say here other than it’s short, tough and very capable of doing its job. The clip is removable for right and left carry but it can’t be repositioned near the blade for tip-down carry. It’s only Tip-UP! 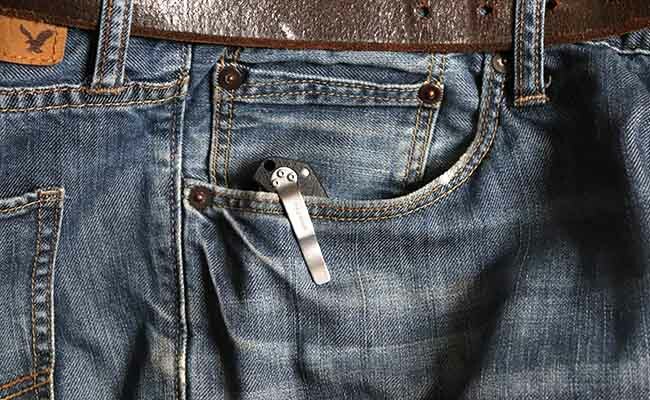 The Cold Steel Pro Lite Clip’s clip in my jeans! We love the light weight of the Pro Lite and we like the thin handles which are less than 1/2 inch thick total side to side. We’d like to have seen a bit smoother opening and closing and the cheap plastic washers certainly were no help to that end! The tri-ad lock was tough to disengage. I’d say it’s not a bad knife at all for use on a campsite and general camping/fishing/hiking service as long as you own a decent sharpening system. There’s always a danger when a company whose reputation for quality (like Cold Steel) takes a chance on offering a budget-priced model of its product. Can you imagine what Ferrari owners would feel if the elite Italian car maker came out with a sports car that looked nearly identical to the Berlinetta, but the retail price was $35K? That would drop the perceived value of Ferraris in general and the prices of the upscale models would plummet. However, we believe Cold Steel did the right thing by making an entry level knife. In this case I think it’s kind of like giving out free crack samples! Remember, “the first one’s always free”. That’s the same concept here. 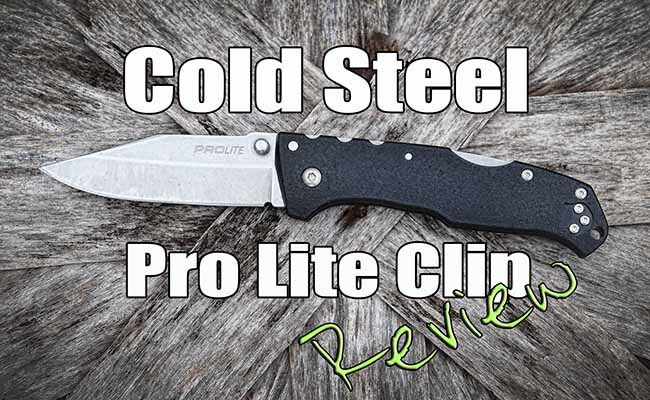 Cold Steel has given us an affordable knife that will get many first time Cold Steel buyers to get their first CS knife here and then move up as their confidence in, and affinity for the Cold Steel brand grows. With all the new carry laws out there this would be a great EDC for me and would not have to worry about the change in carry laws state to state. I always have to make sure I check my pocket before leaving the house with the Pro Lite I would not have to worry. Great review sir, thank you for such an honest opinion. I have carried a pocket knife since I was eight years old. I liked how you presented the Pro Lite and think it would be a good carry knife for my 69th year! I love to hear feedback like yours Kelly! Blessings to you and I’d love to have you comment again in the future or on our youtube channel.